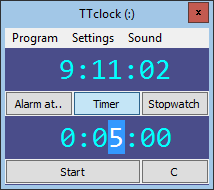 TTclock is a simple, compact alarm clock, countdown timer and stopwatch that can be minimized to the system tray. It has two display modes: pure clock and control panel. How to extract: Download the ZIP package and extract to a folder of your choice. Launch TTclock.exe. Arrow keys for digits: up/down swapped.